[10/12/04 17:30:00] President of the Congress, Giovanni di Stasi stressed the link between human rights and local and regional administration, ''which becomes the first interlocutor of individuals when dealing with individual rights''. [10/12/04 10:00:00] Learn and live democracy – that’s the Council of Europe’s message for 800 million European citizens during 2005 – the European Year of Citizenship through Education. The Year will be launched on 13 and 14 December, during a conference in Sofia, (Bulgaria). The conference will be opened by Bulgarian Education and Science Minister Igor Damianov and Council of Europe Deputy Secretary General Maud de Boer-Buquicchio. The Year aims to bring democracy closer to people by showing how important it is to get involved with issues that concern their everyday lives. Press briefings will take place on Monday at 8.45 am and on Tuesday at 5.15 pm. [09/12/04 12:00:00] ''The Convention, drawn up in the early stages of the Cold War, was from the outset open to all European States willing to adhere. It became a sort of passage through the Iron Curtain and a stepping-stone for full membership in the Council of Europe,'' said the Secretary General today in Wroclaw taking stock of the achievements of the 50 year-old European Cultural Convention. To meet the challenges of today, the new resurgence of the tension between cultural and religious diversity and identity, ''work in the field of culture remains fundamental'', he continued. The Council of Europe would meet these challenges in ''building inclusive, stable, and peaceful societies based on shared values''. [09/12/04 15:30:00] In an exclusive interview on the eve of the celebrations to mark the 50th anniversary of the European Cultural Convention in Wroclaw, Polish Culture Minister Waldemar Dabrowski speaks about the major cultural challenges in Europe and the role which the Council of Europe can play in facing them. [10/12/04 15:00:00] Following the conference launching the celebrations in Wroclaw, Poland, Polish professor Kazimierz Krzysztofek gives his views on the convention’s new role, 50 years on. Among other things, he underlines that it was ''drawn up by a different generation. The current generation is less focussed on institutions and uses technologies of freedom''. [09/12/04 12:00:00] On the occasion of the Wroclaw conference on the past achievements and future direction of the European Cultural Convention, starting on 9 December 2004, the Council of Europe has created an online theme file containing useful information on the convention, including reference documents, reference sites, interviews and useful links. The accompaning event file will be updated several times during the conference with speeches, photos and interviews. 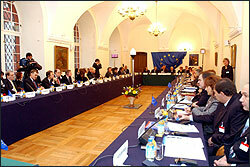 The Council of Europe’s values – under threat? [10/12/04 15:30:00] The Convention on the Rights of the Child (CRC) celebrated its 15th year of existence this year. At the same time, a new Committee of experts on children and families was set up in the framework of the Council of Europe programme ''Strategy for Social Cohesion''. It met for the first time on 8 and 9 December 2004 and launched a new project on ''Supporting parenting in the best interests of the child'', which will make a substantial contribution to the cross-sectoral project ''Children and violence'' due to start in 2005 for a period of 3 years. Gerry Mangan, newly elected Chair of this Committee and Jacob Egbert Doek, special guest and Chairperson of the United Nations’ Committee on the Rights of the Child, share their views on the aims of the new Committee and its cooperation with the United Nations.